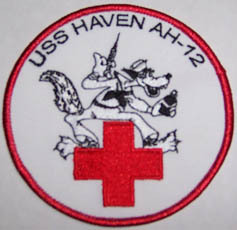 We continue to offer both versions of the official USS HAVEN AH-12, US Navy uniform, ball caps. The hats are the standard Navy Blue ball cap, with USS HAVEN AH-12 embraced on the front along with an embraced silhouette of the ship. Contact us and specify which style (ship with or without crosses) and quantity you would like to purchase. The artwork is all done in the USA by one of the same companies that the Navy uses for ship ball caps. The cost is $20 each which includes shipping. Our ship's wolf logo as patches are on order and expect delivery sometime in the first or second week in March. The first patch as our sample looks great and has the very best quality stiching. The physical size is 3.75" in diameter. The patches are all made in the USA. The cost is $20 each which includes shipping. We have also added something new to the ship's store. Sit back and enjoy the music sound track of "Victory at Sea" while watching a video put together from all the slides, and photos that we have collected. Besides the video (DVD), the disk also contains all the photos we have so far that can be viewed. 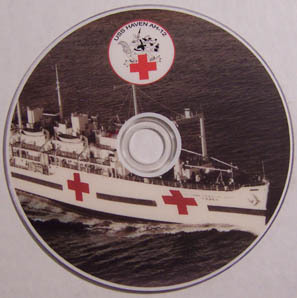 The DVD can be played on your TV's DVD player or a computer that has a DVD player installed. No special software is necessary. The cost is $10 which includes shipping. Call if you have any questions at (253) 531-2183. All proceeds are used to help pay for USS HAVEN correspondence mailing expenses.